I am delighted to have found these amazing designers in Kenya who are committed to using only sustainable materials. And more importantly, committed to improving the lives of single Kenyan women whose hands make all these glorious pieces. I am pleased to present these beautiful pieces to you. SIANA Creations (from one of the Masaai languages Maa root-words meaning nice, lovely, or blessed, and—because it is refreshing—often used where there is fresh water) was launched in 2016 as an initiative to help single mothers on the outskirts of Nairobi, Kenya, earn a living wage. Leveraging the power of great design, local talent, and an abundant supply of sustainable materials – upcycled cowhorn, bone, recycled newspapers, coffee grounds, aluminum and beads from East and West Africa – international entrepreneur Ingrid van Weenen partnered with jewelry designers MARO-designs and Afrodutch Collections to distribute their lines of uncommon jewelry to the North American market – via private boutiques, museum stores, hotels, catalogues, and cruise lines. Prior to establishing Siana Creations, Ingrid lived in the center of Kenya as a CUSO/VSO volunteer, where she worked with a local Kenyan NGO to promote the livelihoods of Forest Adjacent communities to generate improved incomes over the conventional agriculture they had always practiced. Ingrid and the NGO worked with over 800 farmers (primarily women) to grow strawberries, tree tomatoes (also known as tamarillos), and other fruit, such as mangoes. She then set up a factory to produce jams, chutneys, and fruit pulp for the yogurt industry under the brand name Msitu (which means forest in Kiswahili). These products are now sold throughout Kenya at major supermarkets and tourist lodges. While in Kenya, Ingrid met designers Marie-Rose Iberl, Henriette Oldhoff and RuthJepchirchir at the annual Christmas Fair Market in Nairobi, where she was selling her jams and chutneys. 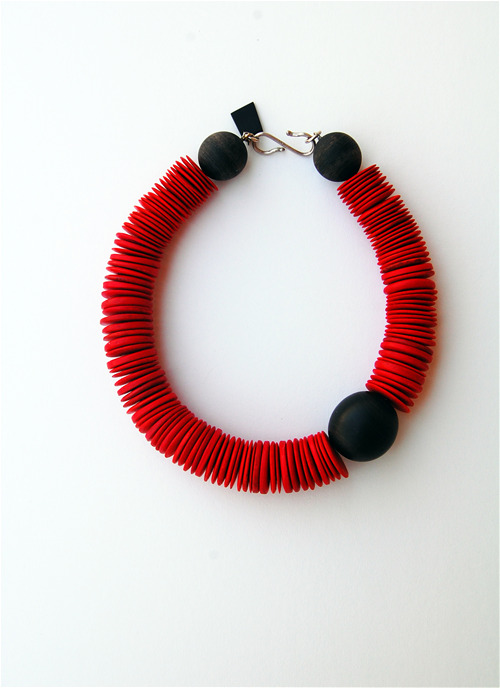 The designers’ goal, like Ingrid’s work with Msitu, was to help empower and provide incomes for women and single mothers by employing them to create beautiful contemporary jewelry from locally sourced and sustainable materials. Once Ingrid saw these beautiful and original designs, she knew there was an opportunity to share the beauty of these unique pieces with women in America. And so the partnerships began. Some of the earliest organizations to feature Siana Creations products in the U.S. include the boutique The Phoenix, The Phillips Collection, and The Textile Museum (all in Washington, DC) and the Nasher Museum in Durham, N.C. Prior to her time in Kenya, Ingrid had a long and successful career in finance and marketing, working at organizations including Citicorp, MasterCard, Harry and David, and AARP. She says she is thrilled to be able to use everything she has learned about money and business to lift up those who are in need. Each piece of jewelry that is purchased helps mothers and their children, and the more that is purchased, the more mothers that are employed. Income-generating opportunities are critical to the empowerment of women and for improving their childrens’ health and education. Ruth Jepchirchir (at the time a cook and cleaning lady) and Dutch designer Henriette Oldhoff started Afrodutch Collections in 2011. Ruth now owns the business in Kenya while Henriette is responsible for the designs and the marketing. The idea behind Afrodutch Collections is to empower and create an income for Kenyan families by making beautiful products, in an ecofriendly way, from mostly discarded natural materials that can be easily found and purchased. The women who work with Ruth and Henriette can bring their babies with them to the workshop and/or work from home. Their standard of living has improved, their self esteem has grown. They are able to provide for their families, afford healthcare for their children, and have the funds for school fees. Using an innovative and labor-intensive technique, adapted from a traditional method once common in Europe of using sheep’s wool, water and soap to make the textile called felt, this adaptation exchanges wool for shredded newspapers and is mixed with water and either sand or coffee grounds. After a long process of pounding, kneading, and ultimately, blending the materials, the mixture that is formed is called paperstone, and is molded into the desired size of beads. Beads are fully dried in the sun and varnished – creating a very light and strong material. 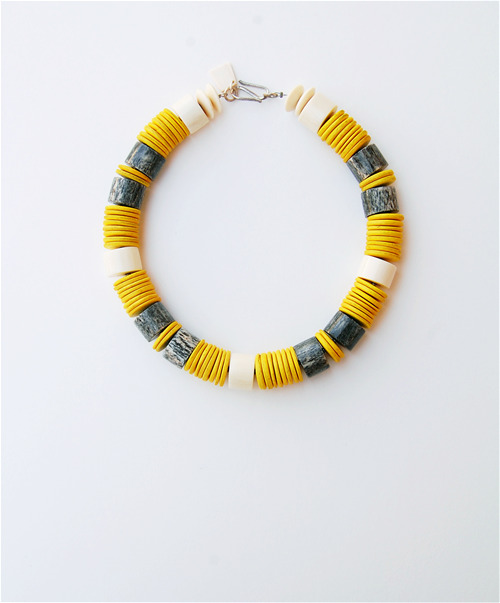 Once combined with handmade beads from Ethiopia, Kenya (wood, horn, bone, recycled aluminum and brass), and Mali (clay), a collection of necklaces are created. Bejeweled is the term that is used to name these beautiful pieces. Each piece is unique, handmade, and eco-friendly. We love to create jewelry out of all kinds of handmade African beads - they say. The idea that people from all over the world value the work of their hands encourage the women who make the jewelry. They also realize that recycling, taking care of the environment and making money are not mutually exclusive. In 2014 and 2015 Afrodutch Collections was nominated by Craft Africa into the Best of 20 of Kenya’s Contemporary Craft and Design Brands. 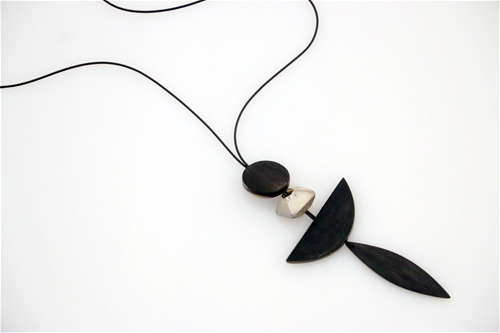 Marie-Rose Iberl has artfully crafted shapes and surfaces from natural materials such as repurposed Cowbone and Cowhorn - traditionally used for household and medicinal artifacts - to show off their inherent beauty. 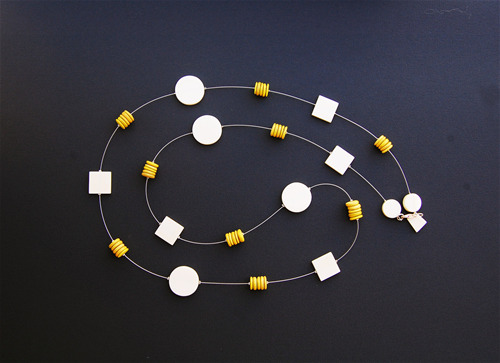 Adding recycled metal as well as silver, she is designing beautiful contemporary jewelry that is entirely handcrafted in Kenya by single women. Based in Nairobi, Kenya, the MARO designs workshop has grown into an “all womens” firm, mainly employing single mothers. The women are full time employees, and receive benefits including healthcare, pension, vacation time, and days off to enroll their children in school. As a child, Marie-Rose dreamed of Africa. It took her 38 years to get there. Her first visit touched something deep inside me she says. Originally from Germany, in 1990 she packed 2 suitcases and moved to Kenya. Always interested in art, she organized small exhibitions for Kenyan artists. One of these was a painter of batik wall hangings, who gave her a pair of earrings as a thank you, Ashanti Dolls carved from wood. These are an old magic fertility symbol. For Marie-Rose it represented female creativity. She asked if these could be made out of bone as well, as this entails even more magic, and he introduced her to Samson Andhoga, the best bone artist in Kenya. In 1992 Marie-Rose decided to open her own workshop, starting with 3 employees. She discovered Cowhorn as another fascinating material. And so MARO designs was born. Now the workshop has grown into a real small manufacturing company – creating high quality, beautiful and unique jewelry – incorporating influences of European fashion, modern and ancient African art. As she says - Modern design uplifts ancient handicraft into contemporary art. Upcycling has become one of her passions, starting with bone and horn she has moved to include recycled aluminum, glass, T-shirt material and other natural elements. MARO designs and Afrodutch Collections partnered with Siana Creations in 2016 to distribute their lines of uncommon jewelry to the North American market – via private boutiques, museum stores, hotels, catalogues, and cruise lines. SIANA Creations (from one of the Masaai languages Maa root-words meaning nice, lovely, or blessed, and—because it is refreshing—often used where there is fresh water) was launched in 2016 as an initiative to help single mothers on the outskirts of Nairobi, Kenya, earn a living wage, leveraging the power of great design, local talent, and an abundant supply of sustainable materials – upcycled cowhorn, bone, recycled newspapers, coffee grounds, aluminum and beads from East and West Africa. 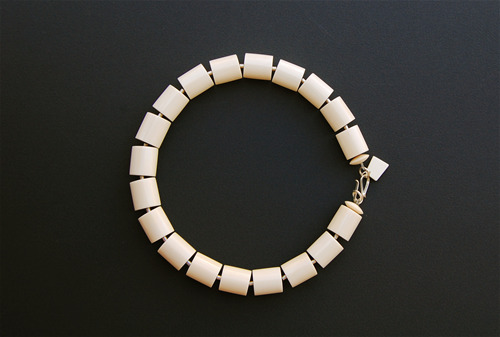 Necklace made in Kenya by single mothers. Yellow cocowood and white cowbone on wire. Necklace is handmade in Kenya by single mothers. 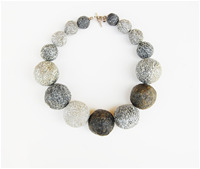 Each bead is crafted using a felting technique with recycled newspaper, sand. The brown beads are colored using coffee grounds.